If your browser keeps redirecting you to search.yahoo.com whenever you are searching for something (and you haven’t set Yahoo as your default search engine yourself), then you probably have a browser hijacker on your Mac. Browser hijackers often come in the form of browser extensions/add-ons, though sometimes they can be apps too. Hijackers set default search engine or homepage/start page of a browser to specific search engines, and stop users from changing those back. Sometimes instead of that they just intercept users’ search queries to Google, Bing and other popular search engines and display search results on the hijacker’s search engine. You may follow instructions below to uninstall the browser hijacker and remove Yahoo Search from your browser. To get rid of Yahoo Search quickly and easily you may run a scan with Combo Cleaner; it is a great antivirus and system cleaner that may be able to remove Yahoo Search from your Mac. You can also try another good AV programs, Bitdefender for Mac or Malwarebytes Anti-Malware. Go to Applications folder and delete Yahoo Search and other new and suspicious apps. Remove Yahoo Search and other suspicious extensions, then change browsers’ homepage, new tab page, start page and default search engine. Select what you want Safari to open on start-up, new windows, new tabs and homepage. Select the search engine you want. Click on three dots menu button . Select More tools => Extensions. Find an extension you want to delete and click REMOVE under it. Right-click the address bar and select Edit search engines…. Click on three dots button next to the search provider you want and select Make default. Click on three dots button next to hijacker search engine and select Remove from list. Click on back arrow at the top of the page (near Manage search engines). Under On startup section select Open the New Tab page. Scroll to the top. Under Appearance section enable Show Home button setting. Clear the textfield of the existing address. Put the one you want or select New Tab page. Click on the search icon in the search bar and click Change Search Settings. Select search engine you want from the drop-down menu. Highlight the hijacker search engine in the table below and click Remove. Under Startup section click Restore to Default button. Keep your OS, browsers and security software up to date. Malware creators find new browser and OS vulnerabilities to exploit all the time. Software writers, in turn, release patches and updates to get rid of the known vulnerabilities and lesser the chance of malware penetration. Antivirus program’s signature databases get updated every day and even more often to include new virus signatures. Download and use uBlock Origin, Adblock, Adblock Plus or one of the similar trustworthy extensions for blocking third-party advertisements on web-sites. This is all not true in my case. i am using MacOS 10.12.1. When using Google search on my Safari Browser I will get redirected to yahoo. Yahoo isn’t present anywhere in my browsers preferences, extensions, etc.. Detection using malewarebytes doesn’t work either. As of Nov 30th 2018 no other note can be found on the internet/youtube to solve my problem, since everything I try that has been desvribed so far on the internet has no effect. There is no app on my Mac nor extension or anything else visible to me. Maybe to others whose help I’d really appreciate. Hello! I am having the same issue! If you ever get this fixed or find out a way to fix this please let me know! By deleting the “Management ” Extension from Safari, as described above, I no longer get a Yahoo search page. But I don’t get my “home” page preference either. anyone have any luck with this? I’m in the same boat, so frustrated. If your Mac is up to date you should be able to see an extra search button next to the search tool bar. Click it and you can choose the directing browser you want. I too have this problem. I have spent hours trying to find Yahoo installed somewhere, but it is not in Extensions, Applications or anywhere visible. Google is the homepage and search engine preference in Safari, it starts off in the window saying Google search and then comes up with Yahoo. I have to go to the google website each time to search. I too dislike Yahoo hugely because of this. I too have the problem, again yahoo not showing anywhere. I just search google in yahoo go into google and continue my search but so annoying. I have the same issue as well….extremely frustrating. I have wasted so much time trying to solve this problem. I would LOVE to get rid of yahoo! How on earth do we get rid of this – Google or Apple should be advising all of us on this – it must be an indictable offence! All the advice just drifts around the basic controls of preferences and has no effect – help, someone, help! I have the same problem and it’s a real time-waster. I always hated Yahoo, now more than ever. Exactly the same with me! So pissed. Has anyone called Apple by chance? I will first thing in the morning. I just rang Apple in the US and they told me to remove the extension I had in Safari, preferences, Extensions. My extension was called ‘Gilpierro’ i unchecked it then uninstalled it and the Yahoo problem has gone away. Hope this helps. Same issue – and I have no extensions listed. I have erased anything and everything that even looks like Yahoo. I hate them now more than ever. Wish it was as easy as Jeremy listed, but No, so if anyone figures out what is going on – let me know. I’ve been dealing with this problem for months. I have tried everything noted here and nothing has worked. There are no extensions in the extension tab for me to delete and I have delete weird apps on my Mac but I get nothing. Any other suggestions? This is happening right now and I’ve never wanted anything less than I want this. I have been trying to fix this FOREVER! I did what you said (Finder> shift + cmd + C) and it brought up Macintosh Hard Drive, Network, & Remote Disc. I double clicked the hard drive and then searched in the upper right Finder search bar “yahoo”. Two files came up. They were videos someone had created maybe using a virus containing software (I reset the Mac to new without using a backup hoping it would fix the problem, it didn’t). Well I moved those two files to the trash and now I have Google back!!!!!! Thank you thank you!! I did what you suggested and seems to have solved my problem! Thank you! Tenia el mismo problema, pero gracias a la aplicación CleanMyMac se ha solucionado, de verdad la aplicación vale la pena, muchas gracias. i did what you said. however there was no yahoo listed in the final list of files. so i just trashed the lot. seems to be working so thx. Thanks. I deleted a Safari Extension called AnySearch 123 and it finally got rid of the cursed Yahoo search. I deleted a Safari Extension called TechNewSearch! That did the trick…no more Yahoo! This nasty yahoo app was installed in my applications folder, but it was INVISIBLE. After I didn’t see it in my applications folder, I found it by doing a spotlight search for “yahoo”, and the app with yahoo in the name came up in the search results under the applications. 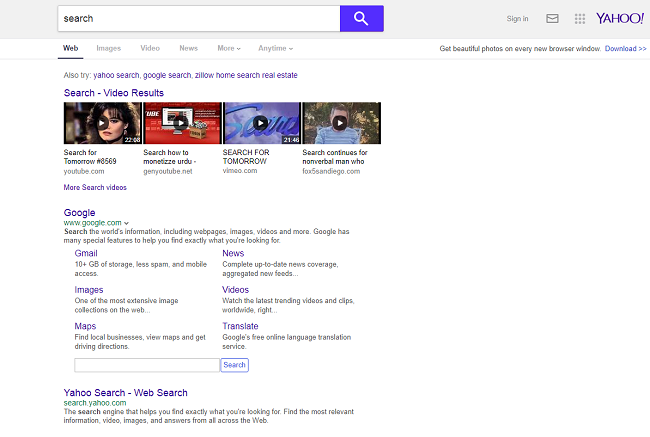 From the spotlight search results window, I did a command-delete on the yahoo app to move it to the trash, then emptied the trash and restarted my computer. All seems well at this point. I have no extension, no unfamiliar apps, but still it is redirecting to Yahoo! Getting mad on this! I had this problem as well. No extensions. No ‘yahoo’ files when searching my hard drive. This keeps happening to me to the point that I reset my computer to factory setting. But after awhile, the dreaded Yahoo search engine took over again. What worked for me this time, was to go into Safari Preferences>Privacy>ManageWebsiteData>RemoveAll. And miraculously I got my Google Search Engine back. Hope this may help someone. I’ve tried every suggestion so far and it seems Yahoo still has some Illuminati stranglehold on my browser. Is Apple tech support ever helpful? Download malwarebytes. It’s free and found all the dodgy files, quarantined them and then deleted them. Worked first time! As above there was something to do with ‘Gilpierro’ in there which was deleted. NO MORE YAHOO! Thank you Paul, Malawarebytes worked! It has worked. I appreciated it, thank you. and uninstall it. it will be fixed. Eu estou tento o problema com o safe Finder Yahoo, não consigo desinstalar do meu MacBook, está me dando uma grande dor de cabeça isso. Eu já não sei mais o que fazer. Se por acaso alguém souber como arrumar, saber mesmo, não somente mandar um link da internet, eu ficarei muito grato.